The use of access control security systems as we know them is fairly new. Access control security systems, in theory, are a variety of methods for controlling who can enter and exit certain locations. In the past, this was usually done by manned stations and gates. The practice behind an access control security system can go as far back as the B.C. years. It can be noticed and read about in the bible or any story that had guards stationed at a gate limiting access to and from protected properties. For example, the Great Wall of China used access control security systems at limited points throughout the giant structure. The guards that manned the different stations would permit or deny access to people trying to pass through. The difference between access control systems then and electronic access control security systems now is all due to technology. With the modern advancements that we have seen with the technological revolution, the need for people to physically let people in and out of places is no longer necessary. Now we are able to use a growing variety of different methods for people approved to gain access to whatever is being protected. With the use of electronic key cards, fobs, or even biometric confirmation we are able to unlock secure doors. Throughout this article, I will describe a few of the different types of electronic access control security systems. I will also provide examples of where access control security systems are best situated. This article will also detail how to go about setting up a new electronic access control system and explain how to choose between the different types of access control systems. If you would like to find out more about access control security systems from a professional security company then visit our website or get in touch with our team at TechPro Security. Our specialty is installing surveillance equipment, security cameras, and electronic access control security systems. We know all of the ins and outs of our business and are involved in every facet of the security industry. 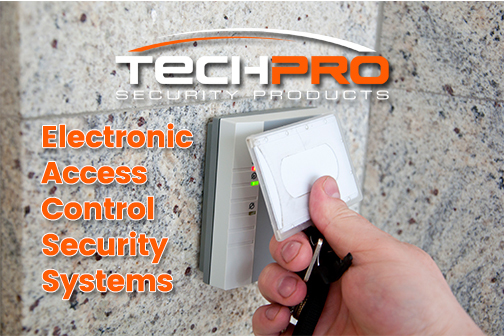 You can read more about electronic access control security systems and find out more information about who we are at the link provided here: TechPro Security Products. As I stated, the practice of access control security systems has been in use for centuries. A traditional access control setup would have a physical security guard permitting or denying access to different locations. We are fortunate to now live in an age where the use of a manned security team is outdated. This is just as true for monitoring surveillance systems as it is for electronic access control security systems. Remote technology has opened up a huge amount of benefits that have become practical solutions we use on a daily basis. With more and more devices connected through networks, we can control an increasing amount of different electronic systems. However, operating electronic access control security systems is done differently than remote technology. Using an access control list we can use three different types of authentication methods. These three different authentication methods are personal user information, physical devices, and biometric information. These varieties are used in different situations based on changing factors. The first authentication method for electronic access control security systems is personal user information. This method relies on something that the person actually knows or information that has been shared with him. Examples of user information are passwords, PIN numbers, or passphrases. These are especially useful for gated communities and apartment complexes. In residential areas such as these, there are many visitors that need to be allowed through these access control security systems. The owner can share a PIN number to delivery drivers or friendly visitors that opens up the gate or complex door. The user information authentication method is ideal for properties that do not need maximum security protection because there is a lot of traffic coming and going. These PIN numbers, passwords, and passphrases can be changed as regularly as you desire. This option is useful if you decide to prevent future access to someone you have previously given out the proper credentials to these electronic access control security systems. The second authentication method relies on physical devices. These physical devices come in the form of electronic cards and key fobs. The technology of these access control security systems recognizes a code that is transmitted to the physical device. This code tells the electronic access control system to allow access and briefly opens the lock. This method is useful for business security or any location that should only be accessed by a specific access control list. For example, employees can open the door to their building during pre-specified hours. It can also be customized to where only some credentials open certain doors but not others. This means all employees can enter the building, but only specified employees can access the network room or a specific floor. The credentials can be turned off as needed in the case that you no longer want to let a specific person gain access to your protected area. The third authentication method is biometric information. Only used in the most secured facilities, this method for accessing electronic access control security systems can read fingerprints or perform retina scans. Many maximum security government facilities or companies use this method in order to prevent any person from gaining the basic information or credentials used in the other two methods. TechPro Security is a professional security company that specializes in the installation of access control security systems and surveillance equipment. We help assist people in deciding the best method to choose for the different access control security systems. After making our recommendations we proceed to go to your site and install the access control system of your choosing. CONTACT US if you have any questions or would like to receive an estimate on installing a new electronic access control system.